From the moment that trailers for Holmes & Watson began appearing on the web, it was clear that something had gone terribly amiss. Despite reuniting the comedy duo of Will Ferrell and John C. Reilly, beloved for the likes of Step Brothers and Talladega Nights, the chemistry in that early footage seemed decidedly off. This was a crasser, less absurdist style of humor, aimed squarely at the lowest common denominator. And really, we shouldn’t have been too surprised—director Etan Cohen (not to be confused with Ethan Coen) is no Adam McKay, with only 2015’s Get Hard to his credit. Is it any wonder, then, that Sony apparently tried to unload the film on Netflix rather than release it wide in theaters? It’s become an oft-repeated industry joke that the world’s largest streaming service is so hungry for feature film content that they’ll snap up anything, ‘ala last year’s post Super Bowl-debut of The Cloverfield Paradox, but here was one case when Netflix wanted nothing to do with the film being offered to them, according to The Wrap’s Alonso Duralde. Netflix, which bought The Cloverfield Paradox from Paramount, reportedly turned down the opportunity to purchase the poorly-testing #HolmesAndWatson from Sony. 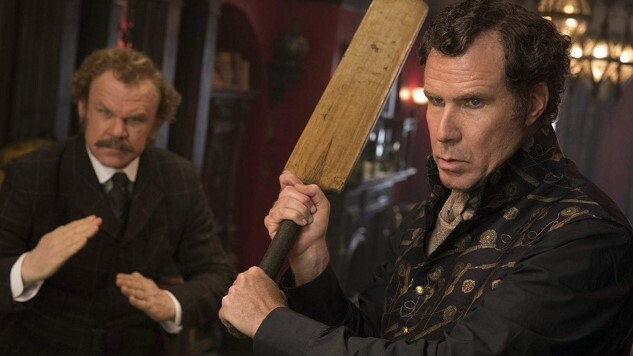 Despite the critical drubbing and the embarrassment of the “so bad Netflix passed on it” stigma, Holmes & Watson will still likely break even when all is said and done. With a relatively small $40 million budget, and close to $20 million in worldwide grosses before its first week is out, it’s not exactly going to put anyone in the poor house. But it does send a message: You can’t dump just anything on Netflix. This seems to be one instance where they made the right choice by letting an opportunity pass them by. With that said, they’re still happy to bring you more Adam Sandler garbage, so don’t go patting them on the back too hard. If you need a reminder of the red flag-laden first trailer for Holmes & Watson, you can also watch that below.